The Secrets Of Chinese Stir-Frying: Why Does It Always Seem To Go Wrong At Home? We all know the pleasures of good stir-fried dishes in Chinese restaurants. There's an ineffable taste about them that says "Chinese," and there are remarkable textures throughout. But when you try to reproduce these things at home, you usually get something else coming out of your wok. Good food, maybe... but not the same food you enjoy at Chinese restaurants. Because the fundamentals that go into real Chinese stir-frying are usually left out of the cookbooks purporting to help you stir-fry! Sure, the right way is a little more difficult, but the results are well worth the effort. Even before you cook, you must make sure you have the equipment essentials. This is key! The enemy of home stir-frying is the small wok -- especially when it's crowded with too many ingredients. 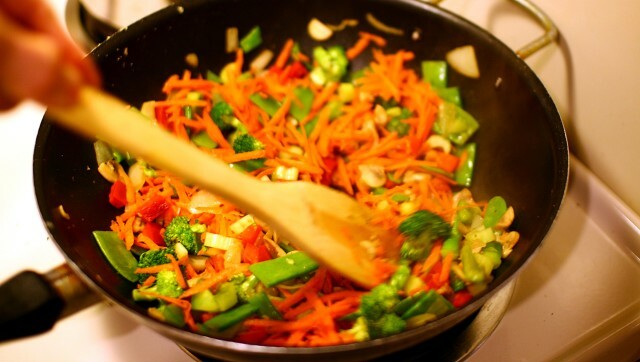 Lots of vegetables, for example, in a too-small wok, steam rather than fry when you cook them. The flavors and textures of steaming and frying are totally different! You need girth in your wok and not too many ingredients cooking in it! 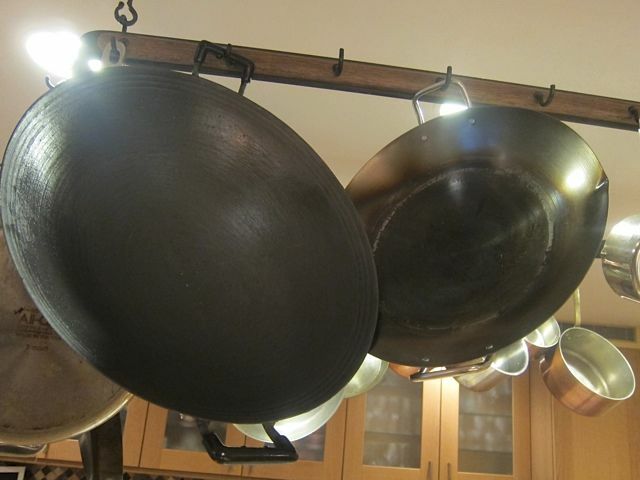 The best place to find big woks is at Chinese hardware stores in your local Chinatown. Choose the wok on the left! Stir-fry over the biggest flame you can muster: another key! One of the essentials of Chinese-restaurant stir-frying is what they call "the taste of the wok." This taste comes from high-heat contact between ingredients and metal. Once again, if the wok's not hot enough, the food will taste braised, or even steamed. Now, it's not easy to reproduce the dramatic inferno of restaurant burners at home -- but make sure to crank the heat all the way up on your hottest stovetop burner! Once you start stir-frying, things go quickly. So, as you know, you must have everything prepped before the stir-frying begins. Prepping the aromatics. Most stir-fries involve ginger, garlic, onions, chiles, etc. Figure out what you need, mince away and reserve. FOR THE BEEF: Prepare garlic and ginger. 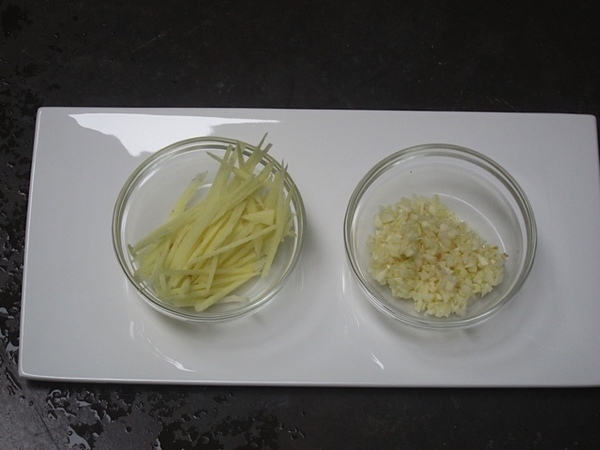 Fine julienne of ginger, and minced garlic. Prepping the vegetables. Do whatever cuts you need for your dish, and reserve the cut vegetables. 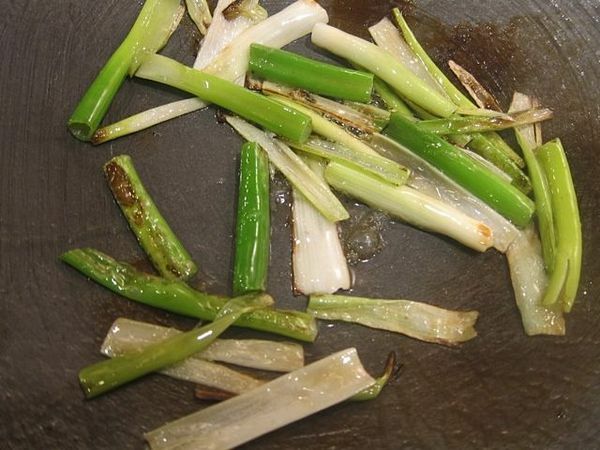 FOR THE BEEF: Cut scallions in broad slivers. 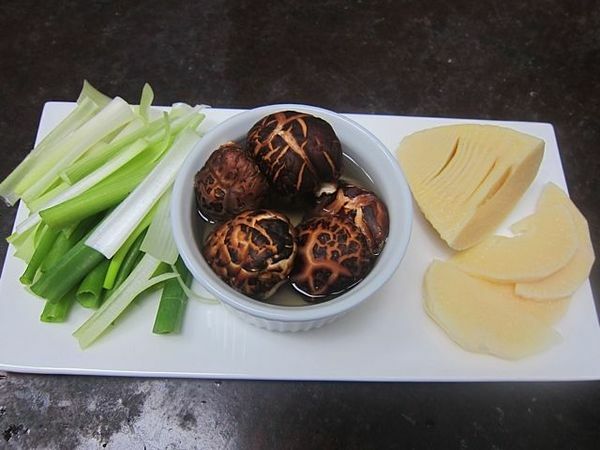 Soak dried Chinese mushrooms in hot water for 20 minutes. Cut chunks of fresh or frozen bamboo shoot into slices (canned will do, but it's not as good). The cuts you want are usually the ones with maximum surface area exposed to pick up the taste of your hot wok! Scallions, dried mushrooms (to be cut after soaking), and frozen bamboo shoot. Prepping the sauce: Combine the ingredients of your sauce in a bowl or measuring cup. FOR THE BEEF: The sauce contains oyster sauce, shaoxing (rice wine), soy sauce, stock (I use beef stock) and sugar. Use the best ingredients you can. Mix to taste. 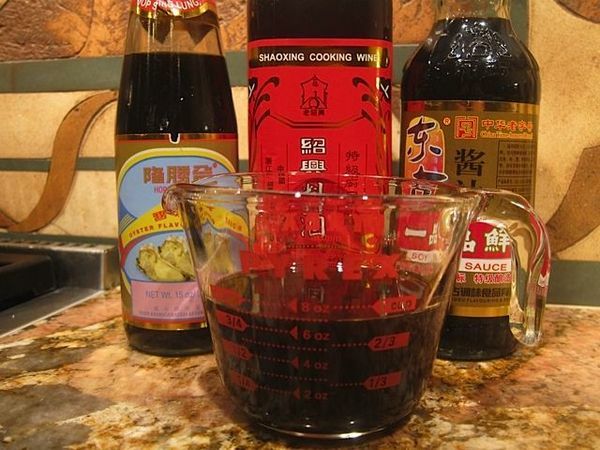 Oyster sauce, shaoxing and soy sauce. Prepping the cornstarch: Most stir-fry sauces are thickened with cornstarch mixed with water to make a slurry. To keep things flowing at stir-fry time, it is good to prepare this in advance in a small bowl. You'll need a few teaspoons of cornstarch, and just enough water stirred in to create the texture of heavy cream. Prepping the protein. This is another key element in a proper stir-fry! Most home cooks are surprised to realize that the proteins of Chinese-restaurant stir-fries are often pre-cooked, in another way, before they go into the stir-fry! The most important form of pre-cooking proteins is: frying in deep oil! 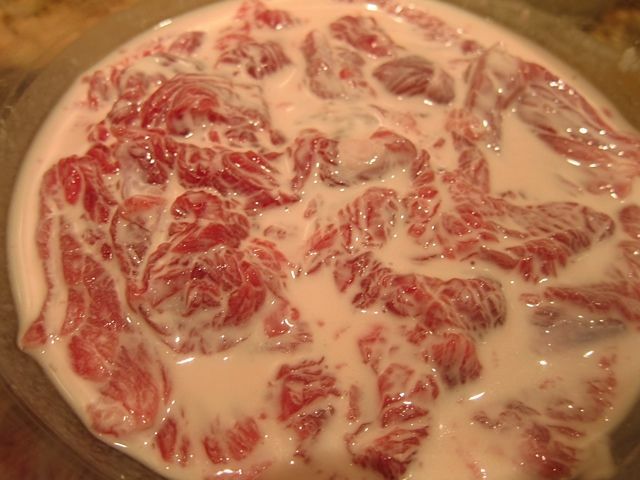 Proteins are usually marinated and/or coated as well. Believe me: it changes everything! No more grey, listless meat in your stir-fries! FOR THE BEEF: This step takes the most time and trouble in this dish. First, you want to slice the beef fairly thinly, about 1/8 of an inch. 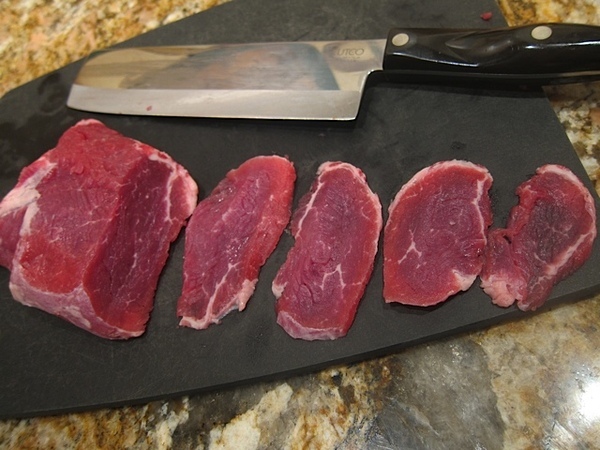 Placing the beef in the freezer for 30 minutes or so helps you slice more easily. London broil from the shoulder, frozen briefly and thinly sliced. FOR THE BEEF: Next, the crucial beef step: sprinkling your slices with a little baking soda -- about a teaspoon for half a pound of beef -- toss, and allow to rest for 30 minutes in the fridge. The baking soda gives the meat a lush, velvety texture. Beef slices with baking soda, just before tossing and holding in fridge. FOR THE BEEF: After the beef and baking soda have sat for 30 minutes, wash off the baking soda with water. 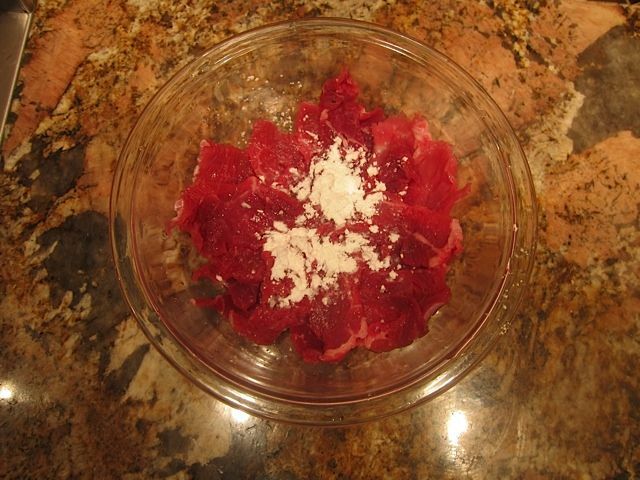 Then toss the wet beef in a bowl with a few teaspoons of cornstarch, to make a crispy coating. Add just enough water to distribute the cornstarch. The beef with cornstarch coating, just before frying. 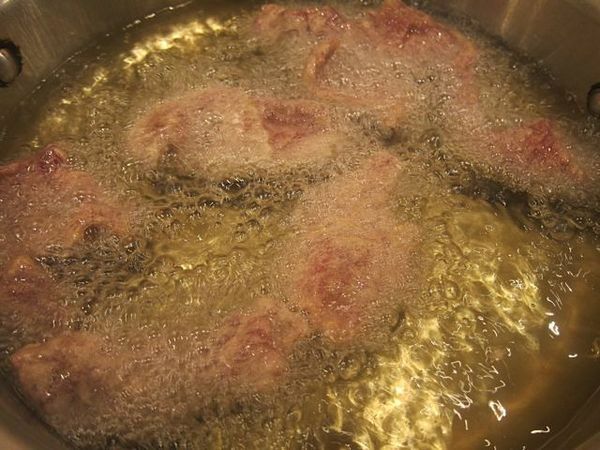 FOR THE BEEF: Heat a deep pan of frying oil to about 375 degrees. Add the beef, slice by slice, working quickly. Stir while frying. Cook for about a minute. 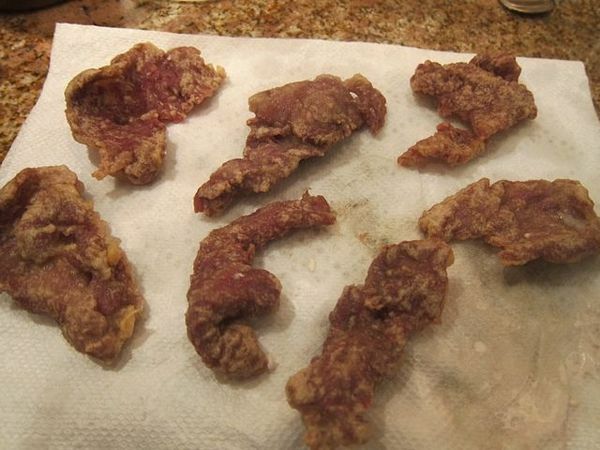 Coated beef frying in hot oil. FOR THE BEEF: Remove the beef quickly, and place on paper towels. Salt. Reserve. Crispy beef resting after frying. STEP #4: Time to start the dish in the wok by heating and adding vegetables. How you do it counts! The key principle here, as the Chinese say, is: hot wok, room temperature oil! In other words, get your wok very hot before adding anything. I do that by putting the empty wok over the highest flame, and letting it sit for 1-2 minutes before adding a few tablespoons of oil, preferably by swirling the oil down the sloped sides of the wok. Then you're ready to add the vegetables (please note: sometimes vegetables are pre-cooked as well, such as pre-steamed broccoli!). Scallions browning in the hot wok. STEP #5: Now it's time to add the aromatics. Many cookbooks call for aromatics first, before vegetables. 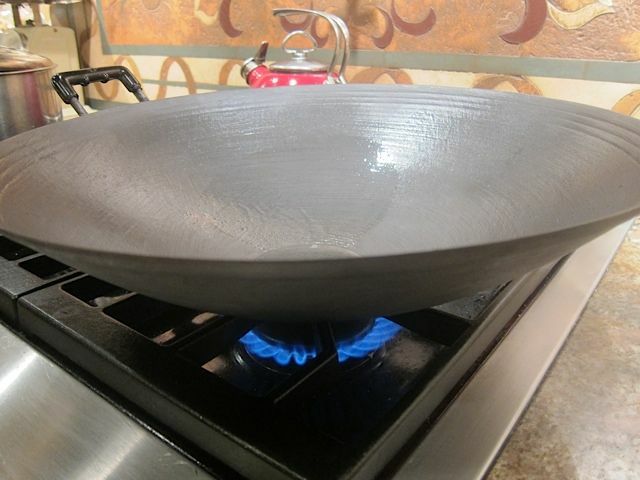 But if your wok is really hot, they'll burn! I like to add them after scorching the vegetables. FOR THE BEEF: Add the aromatics to the hot wok. In this recipe, the drained and chopped mushrooms go in at this time as well. 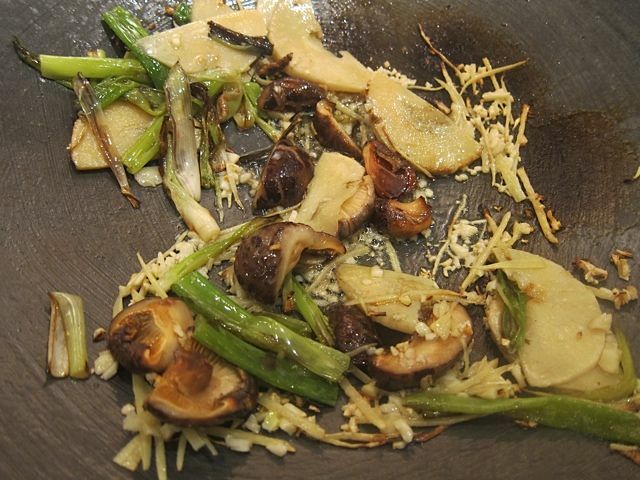 Scallions, bamboo shots, mushrooms, garlic and ginger in hot wok. STEP #6: Finally the pre-cooked proteins get added in. 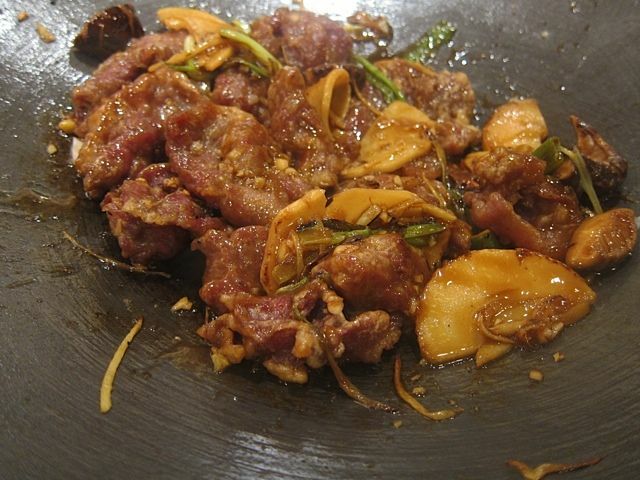 Usually, this will require only a quick-toss after the proteins go into the wok. 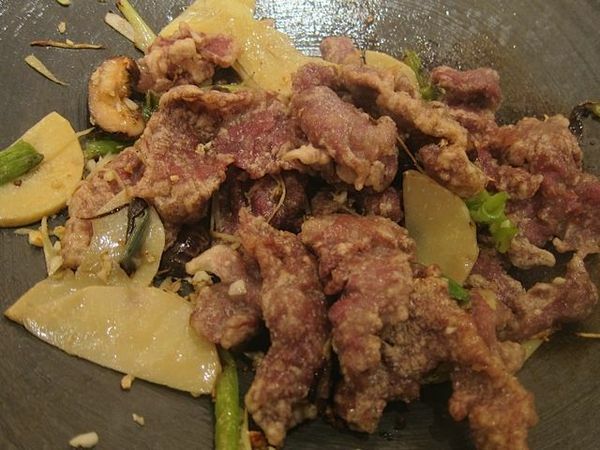 FOR THE BEEF: Try to finish off the deep-fried beef as close as possible to the moment you add the beef to the wok. Add and stir. Adding the crispy beef to the wok. Beef and vegetables tossed with sauce, thickened with cornstarch slurry. STEP #8: Chinese chefs like to finish off many stir-fries with a very small amount of sesame oil (like a quarter-teaspoon) drizzled over and stirred in just before serving. Then, the dish gets turned out on a platter, just like in the restaurant! 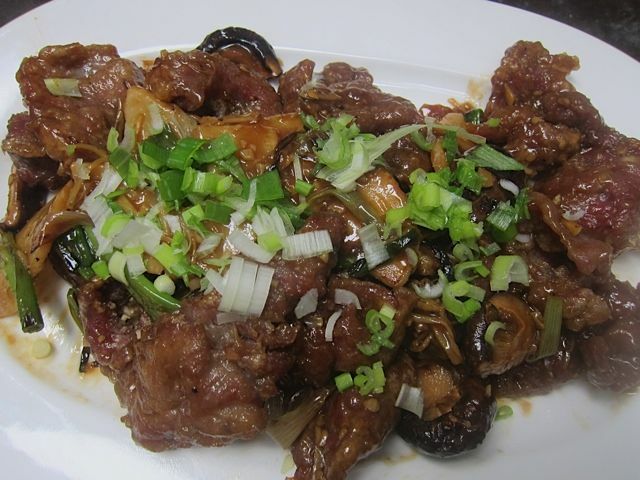 The finished Crispy Beef with Oyster Sauce, garnished with minced scallions. The whole process is really not difficult. It's just like riding a bike: once you figure out the basic hows of good stir-frying, the procedure will become second nature to you! Soon you'll be doing two or three at once, dazzling your dinner party guests! Are you ready to start writing enigmatic sayings for your home-made fortune cookies?